Grapes are one of the world's most economically important fruit crops, but the woody perennial takes three years to go from seed to fruit, and that makes traditional breeding expensive and time-consuming. A team of Agricultural Research Service (ARS) researchers has found a way to speed things up by developing a way to identify genetic markers in the grapevine's genome that can be linked with specific traits, such as fruit quality, environmental adaptation, and disease and pest resistance. Computational biologist Doreen Ware, geneticists Edward Buckler and Charles Simon, and research leader Gan-Yuan Zhong have developed a relatively fast and inexpensive way to identify genetic markers not only in grapes, but also in other crops by using modern sequencing approaches. Ware and Buckler work at the ARS Robert W. Holley Center for Agriculture and Health in Ithaca, N.Y.; Simon works at the ARS Plant Genetic Resources Unit at Geneva, N.Y., and Zhong is at the ARS Grape Genetics Research Unit, also at Geneva. The researchers used the technology to sequence representative portions of the genomes from 10 cultivated grape varieties, six wild varieties and the clone of Pinot Noir originally sequenced by scientists in 2007. They developed filters that allowed them to make corrections for common sequencing errors, and discovered thousands of high-quality single nucleotide polymorphisms, or SNPS, which are genetic markers that can serve as signposts for showing how plants are related to each other. They then used 9,000 of those SNPs in a custom-designed assay to examine DNA patterns at defined points along each cultivar's genome. They found the SNPS contained enough data to identify the relationships and geographic origins of the cultivars. The work was published in PLOS One. 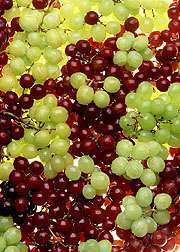 Improved technology is expected to make it possible to one day sequence the entire genomes of large numbers of grapes. But in the meantime, the work will help researchers identify portions of the grape genome where they can find genes that confer desirable traits, offering better information for breeders developing new varieties. The technique also should make it easier to identify the origins of other types of plants, characterize relationships in other plant collections, and accelerate genetic mapping efforts in a number of crop species.